This article originally appeared on FAIR. The three most prominent U.S. newspapers haven’t run a critical investigative piece on Jeff Bezos’ company Amazon in almost two years, a FAIR survey finds. A review of 190 articles from the New York Times, Wall Street Journal and the Bezos-owned Washington Post over the past year paints a picture of almost uniformly uncritical — ofttimes boosterish — coverage. None of the articles were investigative exposes, 6 percent leaned negative, 54 percent were straight reporting or neutral in tone, and 40 percent were positive, mostly with a fawning or even press release — like tone. The last major investigative piece we found in any of these three publications was a 4,500-word critique of Amazon’s labor practices in the New York Times (8/16/15) almost two years ago. Considering that Amazon is the fourth-most-valuable company in the world, with a 43 percent (and growing) share of all US online commerce, it’s a striking absence of journalistic scrutiny. The line between straight reporting and fawning coverage wasn’t always clear, given the nature of technology journalism, but, in general, a distinction was drawn when reporting on Amazon’s latest moves featured no criticism or contrary third-party input, and the article was mostly indistinguishable from a press release. 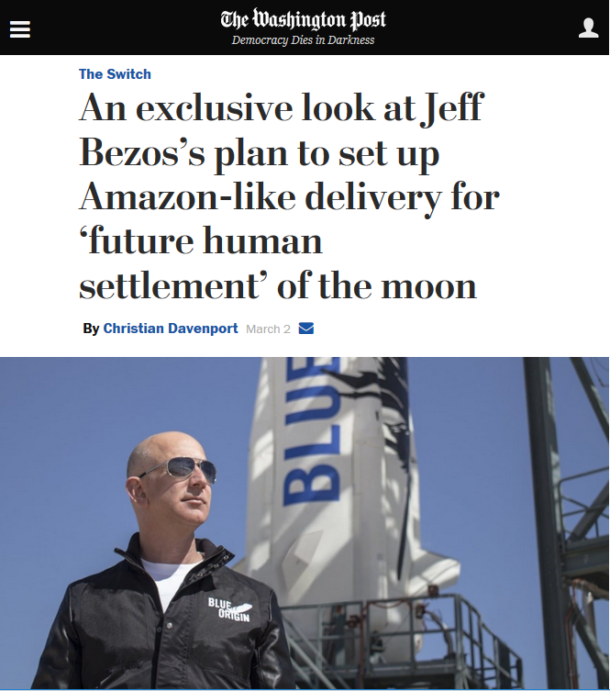 Amazing how a Bezos-owned paper got an “exclusive” on Jeff Bezos! One can review the list and determinations here. We included articles about Amazon.com, Inc. (reviews of Amazon TV shows or stories about Amazonbestsellers, for example, were not included) that were significant enough for the outlets’ respective Twitter accounts to post the stories. One might expect the Washington Post — the personal property of Bezos — to provide more favorable coverage of its owner’s company, but the Post’s level of uncritical praise, though very high, was roughly par for the course. About 95 percent of Post coverage ranged from neutral (43 percent) to positive/fawning (48 percent) in tone. One of the major reasons Amazon gets such glowing coverage is that tech journalism is traditionally not a very critical vertical. Tech company X reveals it’s doing Y or will do Z — that is, by the beat’s definition, newsworthy, and the press release is rewritten, with some added commentary from friendly talking heads and market analysts. Because it’s “tech,” the political or labor implications come in a distant second to the shiny-object quality of the beat. Occasionally issues such as privacy or anti-trust or union unrest will be touched on, but this is usually in response to legal action taken by the state or by activists, not as a topic raised by reporters themselves. On a case by case basis, this is understandable (clearly not every tech write-up has to be an exposé), but on the whole, tech journalism is a media landscape dominated by corporate stenography. With Amazon’s stock surging to well over $1,000 a share, and its head recently crowned the richest person in the world, the stakes for putting Amazon and Bezos in a critical light couldn’t be higher. Yet time and again, the pillars of US media provide them all the critical rigor a high school paper typically provides the spring dance committee.